Our postgraduate accommodation is just a short walk from our campuses and is a great place to make friends and live with other postgraduate students. If you’d like to have a look around our halls before you apply, come along to one of our Open Events. 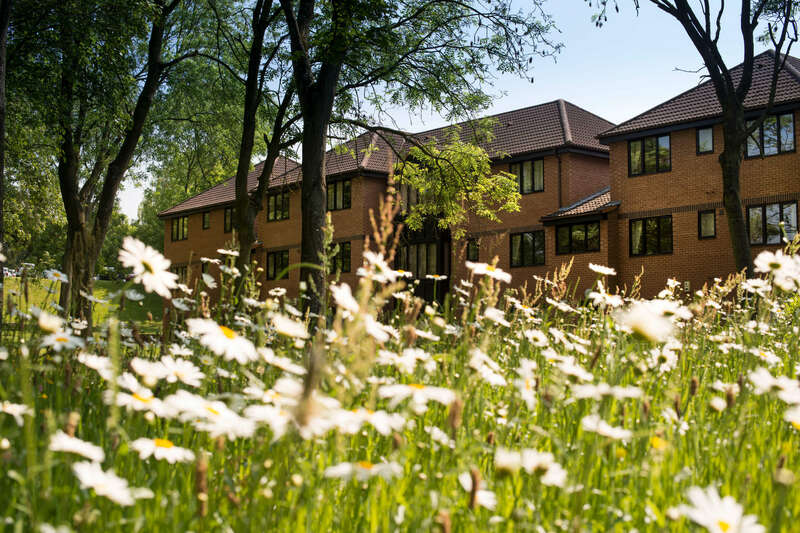 Our halls of residence are a convenient base for anyone needing accommodation during their course, close to the city or town centre and within easy reach of our facilities. You can choose between our small complex of apartments or immerse yourself in the full swing of student life by sharing with undergraduates in our larger and more traditional halls of residence. Safe and secure with staff on site 24 hours a day, halls offer you cost-effective accommodation with electricity, gas, water, Wi-Fi and room contents insurance included in the price. En-suite bedrooms are available, as are rooms suitable for anyone with a disability or medical condition. In a quiet residential area next to our Kedleston Road site, Flamsteed Court is a small complex of 30 two-bedroom apartments. Each apartment has free parking, two double en-suite rooms, an open plan kitchen/diner and lounge including a television (licence paid). With the University’s library, the Union of Students and Sports Centre close at hand, you’ll also find bus stops for the city centre or local shops just a minute away. Across the road is Markeaton Park, popular for family or outdoor activities. If you’d prefer to rent a private property with your friends or by yourself, we can help you find the right place through the DASH scheme. If you have any questions about accommodation, contact us. There are lots of benefits to living in halls when you move to a foreign country. All our halls are located near to the University, local shops, bars and restaurants. The University of Derby’s halls fees are all inclusive so you won’t have to pay any extra bills. Along with the staff at Derby’s award-winning International Student Centre, halls staff will make sure you settle into your new home and they are always on hand to help you with any issues you may have. There is also a dedicated Halls Wellbeing Co-ordinator.